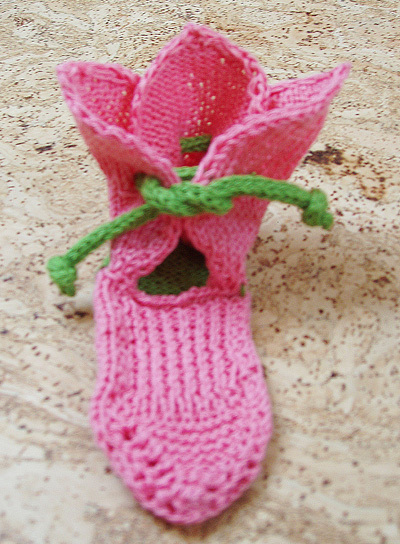 Always fresh from the spring garden, these adorable booties will brighten a baby girl's toes any time of year. They're also sure to garner lots of oohs and ahs at the next baby shower. Featuring a close fitting foot and I-Cord closure that's easy for grown-ups to tie and untie, these booties will stay on better than most. 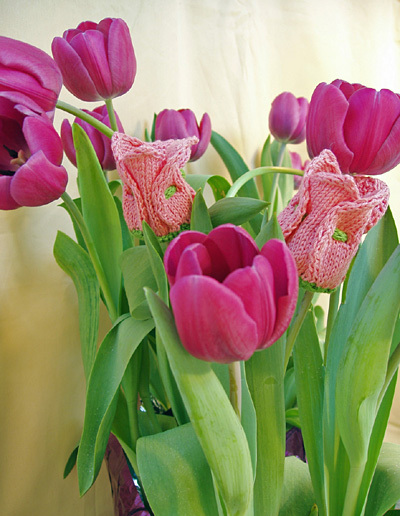 Despite the fine gauge, these little flowers knit up quickly -- knit a pair in 2-3 evenings or a whole bouquet in a week. And the best feature is the no-sew finishing -- just block them flat and weave the I-Cord tie through the petals! If substituting yarn, stick with cotton/wool or cotton/acrylic blends. Pure cotton may not have enough body for the petals to stand up. Using CC and straight needles, CO 9[11,13,15] sts. Row 1 [RS]: K2, kfb, k to last 3 sts, kfb, k1, p1. 11[13, 15, 17] sts. Rows 2 & 4 [WS]: Sl 1, p to last st, k1. Row 3 [RS]: Sl 1, k to last st, p1. Row 5 [RS]: Sl 1, k1, kfb, k to last 3 sts, kfb, k1, p1. Repeat Rows 5-8 0[1, 1, 2] times more. 13[17, 19, 23] sts. Work 2[0, 2, 0] more rows in patt as set. Break CC. Using MC, work 16[20, 22, 24] rows in stockinette st as set, slipping first st of each row and working end sts in reverse stockinette st. Decrease Row [RS]: Sl 1, ssk, k to last 3 sts, k2tog, p1. Repeat these 2 rows 0[2, _, _] times more. 11 sts. Work 1 row in patt as set. _[_, 15, 19] sts. Next Row [WS]: Sl 1, p2tog, p to last 3 sts, p2tog tbl, k1. Repeat these 2 rows 0[0, 1, 2] times more. Work Decrease Row once more. 5 sts remain. Next Row [WS]: Sl 1, [sl 1, p2tog, psso], k1. Next Row [RS]: Sl 1, k2tog, psso. Break yarn, draw through last st and pull tight. Lay sole flat with WS facing, so that heel (CC section) is nearest you. Pick up and k 1 st at right edge of first MC row. Turn work and CO 12[14, 16, 20] sts. 13[15, 17, 21] sts on needle. The top of the foot will be worked over these sts, and 1 st will be picked up from the edge of the sole at the beginning of each row. When the instructions for this section refer to the left or right edge of the sole, this refers to that edge of the sole when it is placed wrong side up, with the heel closest to you. Row 1 [WS]: Pick up 1 st in edge st of first MC row at left edge of sole, p this st together with first st on needle, p to end. Work is now attached to sole at each end of row. Row 2 [RS]: Pick up st in edge st of second MC row at right edge of sole, k2tog tbl with first st in row; k to end. Row 3 [WS]: Pick up st in edge st of second MC row at left edge of sole, p2tog with first st in row; p to end. Next Row [RS]: Pick up st in edge st of next row at right edge of sole, k2tog tbl with first st in row; [p1, k1] to end. Next Row [WS]: Pick up st in edge st of next row at left edge of sole, p2tog with first st in row; [k1, p1] to end. Repeat these 2 rows 5[7, 8, 8] times more. Decrease Row 1 [RS]: Pick up st in edge st of next row at right edge of sole, k2tog tbl with first st in row; ssk, k to last 3 sts, k2tog, k1. Decrease Row 2 [WS]: Pick up st in edge st of next row at left edge of sole, p2tog with first st in row; k to last st, p1. Repeat these 2 rows 2[3, 4, 6] times more. Work Decrease Row 1 once more. 5 sts remain. Next Row [WS]: Pick up st in edge st of next row at left edge of sole, p2tog with first st in row; sl 1, k2tog, psso, p1. Hold sole with RS (bottom) facing, heel up. Beginning 3 rows from CO along right edge, pick up and k 1 st in each of first 3 rows of CC section, pick up and 7[9, 11, 13 sts along CO edge, pick up and k 1 st in each of first 3 rows along left edge. 13[15, 17, 19] sts. *Row 1 [WS]: P all sts. Row 2 [RS]: Sl 1, k1, kfb, k to last 3 sts, kfb, k1, p1. 2 sts increased. Row 3 [WS]: Sl 1, p to last st, k1. Repeat Rows 2 and 3, 2[2, 3, 3] times more. 19[21, 25, 27] sts. Work 0[2, 2, 4] more rows in stockinette st as set (slipping first st of each row and working last st of each row in reverse stockinette st). Eyelet Row 1 [RS]: Sl 1, k1[2, 2, 3], BO 2 sts, k1[1, 2, 2], BO 2 sts, k2[2, 4, 4], BO 2 sts, k1[1, 2, 2], BO 2 sts, k0[1, 1, 3], p1. Eyelet Row 2 [WS]: Sl 1, p1[2, 2, 3], yo, p2[2, 3, 3], yo, p3[3, 5, 5], yo, p2[2, 3, 3], yo, p1[2, 2, 3], k1. 15[17, 21, 23] sts. Work 4[4, 4, 6] rows in stockinette st as set. Row 1 [RS]: Sl 1, ssk, k to last 3 sts, k2tog, p1. 2 sts decreased. Row 2 [WS]: Sl 1, p to last st, k1. Work 0[2, 2, 2] rows in stockinette st as set. Repeat Rows 1 and 2 0[1, 1, 2] times more. 13[13, 17, 17] sts. Row 3 [RS]: Sl 1, ssk, k to last 3 sts, k2tog, p1. 2 sts decreased. Row 4 [WS]: Sl 1, p2tog, p to last 3 sts, p2tog tbl, k1. 2 sts decreased. Repeat Rows 3 and 4 1[1, 2, 2] times more. 5 sts remain. Hold sole with RS (bottom) facing, heel at left, toe at right. Pick up and k 1 st in each of first 3 rows of MC section (overlapping Top of Foot section), pick up and k 7[9, 11, 13] sts along side of CC section to edge of Heel Petal, pick up and k 1 st in each of remaining 3 rows of CC section (overlapping Heel Petal). 13[15, 17, 19] sts. Work from * to * as for Heel Petal. Hold sole with RS (bottom) facing, toe at left, heel at right. Pick up and k 1 st in each of first 3 rows of CC section (overlapping Heel Petal), pick up and k 7[9, 11, 13] sts along side of CC section to edge of MC section, pick up and k 1 st in each of first 3 rows of MC section (overlapping Top of Foot section). 13[15, 17, 19] sts. Make second bootie in the same way. Using CC, CO 4 sts. Work 11[12, 13, 14] inches of I-Cord. Weave in ends. Block petals. 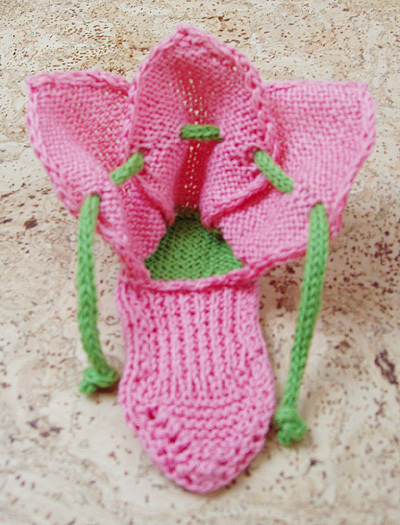 eyelet in each Side Petal, so that an even length of tie emerges from each. Weave each end back through next hole in Side Petals and Heel Petals.. Weave each end back through next hole in Heel Petals and Side Petals. Weave through remaining holes in Side Petals. Cross ties in front and thread each end through first hole in opposite Side Petal. Tie ends in small overhand knots. When worn, pull ties to tighten and tie to secure booties. A pattern rebel from the moment she picked up knitting needles at age 13, Cathy's knitting has gradually evolved from riffs on existing patterns to true originals. With a preference for bold color, unconventional forms and immediate gratification, she specializes in designs for babies and children. 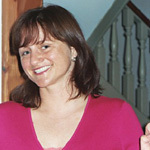 When she's not knitting or working on her new website, Cathy is a marketing exec in the leisure travel industry.